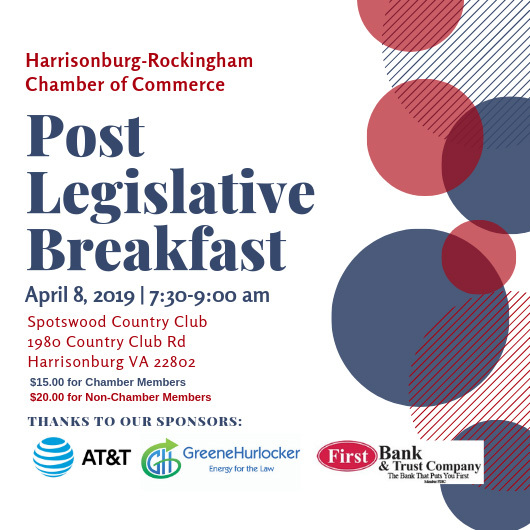 On April 8, our Harrisonburg partner Jared Burden will join in sponsoring the Harrisonburg-Rockingham Chamber of Commerce and Shenandoah Valley Technology Council’s Post Legislative Breakfast with legislators and business leaders discussing the laws, budget actions and plans made at the recent General Assembly session. The discussion starts at 7:30 a.m. and we hope, if you’re interested, you’ll register with the Chamber here. If you have questions about the event, contact the Chamber. If you want to know more about our Harrisonburg practices or need to discuss a legal issue, just get in touch with Jared, or any of our business lawyers.